How do you retire from chess? During the week I have had to make two trips to Sydney for chess related business. While Sydney is becoming increasingly difficult to get around in (by car at least, public transport is often better) I did make one useful detour. Sappho Books is a second hand bookshop / cafe on Glebe Point Road, and currently has quite a large collection of second hand books (and by large, their catalogue has over 1000). Due to the sale of a personal collection, the range of books (and pamphlets) cover almost every facet of the game, and range in age of recent publications to a number of old classics. Operating on a very limited budget, I looked rather than purchased, as I was likely to walk out with more than I could carry if I unleashed the credit card. Of course I will probably have a more detailed shopping list the next time I return, but for now, I leave it to others to empty the shelves. Some books are probably priced a higher than they should be (no doubt based on price lookups on the interent), but there are still plenty of cheaper and/or historic books. So if you are in the Glebe area of Sydney (or in the mood for a special trip) I do recommend you drop in, either to build up your chess library, or simply for a coffee and a browse. With news that former World Champion Vladimir Kramnik is retiring from professional chess, I'm wondering what the actual process for doing this is. In Kramnik's case it is a little more clear cut, as he did specify 'professional' chess, and I'm assuming this means he won't be playing any high level events, at least in the near future. He has said he will now be focusing on chess education projects, so it isn't the case that he is quitting chess altogether. There have been some famous 'retirements' over the years, some which have been reasonably permanent and some that have not. Emmanuel Lasker retired a few times in his career, but kept coming back after a period away from the board. Gary Kasparov's retirement in 2005 has been a more 'proper' retirement, although he has continued to play exhibition style events (and some competitive quickplay tournaments) since. Bobby Fischer also stopped playing after 1972 (until 1992) but he didn't so much retire as simply refuse to play anyone. As for non-professionals, players don't so much retire, as just give up playing. Everyone now and then you might see an announcement of social media about 'taking a break from the game', although I find players who do this seem to return for the next tournament after all (As an aside I know at least one player who announces they are quitting chess after almost every loss). More commonly players just drift away from actual play, until they convince themselves that it is too hard to get back into the rhythm of club or competition chess. So not quite retired, instead, just not active. Here is another interesting game from the 2019 Gibraltar Masters. Lev Aronian beat Nigel Short in a game where Aronian looked to have an increasing advantage throughout. After the game Short commented that he could have resigned around move 25, and he couldn't understand what he did wrong. I can sympathise with his predicament, as I often get lost positions without realising it until far too late. In Short's case it does become clear that his queenside pawns are the problem, but what he should have done is a more difficult question the answer. Finding a refutation to every opening you face is the dream of the average player. Of course it should remain a dream, as such a thing is not possible. However, this does not stop chess books (especially 'repertoire' books) from promising something very close to this. I must confess I get seduced by such claims, and even if I am aware such a line won't work in every circumstance, Is still think it might still be good enough to beat most players. One example is my anti Pirc/Modern line, which I have been playing for around 10 years. It is a pretty basic cave-man line, based around Be3,Qd2,Bh6 and f4. While I have had some success with it, it has also gone wrong when my kingside hack runs out of steam, and I get wiped out on the queenside. So I was quite pleased to come across the following game from the 2019 Gibraltar Masters. Sure, White outrates his opponent by more than 200 points, but Black, at 2481, is still a lot stronger than players I usually meet. The clash of current and former World Champions always carry some significance. For the ex-champion it is often about proving that they still 'have it' as a player, while for the champion, it is about proving there is a reason why they currently hold the title. So the Round 10 pairing of Anand v Carlsen was always going to be eagerly watched. And just to add some extra spice, Carlsen and Anand were also equal first after 9 rounds. In a long battle, Carlsen emerged the winner, in a very instructive game. Playing a slightly unusual line in the Ruy Lopez, he ended up with a better pawn structure, and then nursed the advantage all the way through to a won ending. Despite the length of the game, it is one worth playing through, as there is plenty to learn from it. "The Ratings of Chessplayers:Past and Present" by Arpad Elo is basically the text book for the FIDE Ratings System. Written in 1978, it describes how the Elo System was developed and has a look at the ratings of players from when it was written, and before. One section of the book is about estimating the rating of players from the 1850s and 60's, when of course there was no rating system to speak of. Based on his calculations, he estimated Morphy's strength at 2695, with Anderssen the second highest at 2552. As an exercise I attempted to apply the same process to all World Champions (as listed in this post), based solely on results between each other. In doing so I came across some interesting statistics, as well as drawing the conclusion that the method Elo used may not have been entirely accurate. The method he used was to take a set of results between a group of players, and based on their percentage score find D(P) for each player (This is the number of points added to the average of the opponents rating to give an estimated performance rating for the player). He gave every a player a starting rating of 500 and then added each D(P) for each player to calculate a new rating. He then averaged these new ratings (weighted by the number of games played) and added the D(P) to this, to get a 'better' rating. After a few iterations the ratings stabilised, which Elo considered 'remarkable'. I'd have to agree with him in this case, as I've never been able to replicate this result with other data. One of the issues that he doesn't mention is that the calculations of D(P) across a pool isn't symmetrical. An example of this is as follows: In a 3 player group Player A score 7/10 against player C. Player B also scores 7/10 against Player C. Player A and B score 5/10 against each other. Player A and B each score 60% which is a D(P) of 72. Player C scores 30% which is a D(P) of -149. So the first iteration would have A and B rated 572 and C rated 351. After the next iteration A and B would be rated 535.5 while C would be rated 423. Iteration 3 would have A and B at 551 and player C at 386.5. At first this looks like the ratings are heading in the right direction (albeit by overshooting and undershooting), but at each iteration, the average rating of the pool is decreasing slightly. This is because the D(P) of A and B adds up to 144, while the D(P) of C is -149. So each iteration sees a loss of 1.66 points across the pool (5 divided by the 3 players). I first encountered this bug years ago when trying to set up a starting ratings system for a group of unrated junior players. I re-encountered it when trying to compare the performance of World Champions using results against each other. The greater the iterations, the lower the ratings became. Which wasn't what I was looking for at all. To get something sensible out of the experiment, I had to add a scaling factor. At the end of the iteration I calculated the net loss of rating points and then 'gave' that back to each player. This kept the average rating at 500 across the pool, and at least made it look sensible. However, my lack of statistical training makes me wonder if I have introduced another error into the calculations. As for the actual results, Kasparov comes out with the highest rating at 565 (add 2250 to this to give a kind of rating typical of today's top players). This isn't particularly surprising, nor is Steinitz bringing up the rear with a rating of 354. What is a little more surprising is that between Fischer (527) and Kasparov are Carlsen (548), Karpov (538), Anand (530) and Kramnik (541). The score for Anand and Kramnik I found a bit surprising, although the fact they played lots of games against Kasparov and Karpov may have lifted their own ratings. For the older World Champions Lasker (500) and Capablanca (512) are slightly ahead of everyone until Fischer, although the run of Soviet champions from Botvinnik to Spassky are tightly bunched in the 489 to 499 band (Probably because they played against each other a lot, and drew a lot of these games). What does this prove? Probably nothing. The data set makes no distinction between the ages of the players ( eg Anand has games against Smyslov, Tal and Spassky), and so results from when a player is improving are weighted the same as when they are at the end of their career. As an exercise in calculation (and programming) it was an interesting one, but until I check my working, it may not be an accurate one. Way way back in the day, there were a few things that stood out in Internet Chess. The 2m+12s time control was the first, and takebacks was the second. The reason for such a big increment was due to 'lag', a problem eventually solved by the invention of 'timeseal'. I remember feeling that the topic of 'takebacks' was kind of divisive in the online chess community. Some players allowed them for obvious mouse slips, while others had a strict 'no take back' policy. While I think the latter choice makes much more sense for everyone, I personally was a bit of a softie. I never asked for them if I made a misclick, but never refused them if asked (as far as I can recall). I'm pretty sure there was the occasional opponent who wanted to fix up a blunder (rather than a mouse slip), but honestly, I wasn't fussed. At least in online competitions, this is now a thing of the past. Otherwise Black in the following game might have gone 'oops, clicked on the wrong piece', rather than get mated in 2. But his whole position was so horrible at that point, he may have wanted to just get the game over with. Gibraltar 2019 begins this evening (or 1am tomorrow morning to be precise), and once again a very strong field is taking part. Maxime Vachier-Lagrave is the top seed, with Lev Aronian, Wesley So and Yangi Yu, close behind. Unlike previous years, Australia isn't that well represented, with IM Gary Lane (who plays GM Pavel Eljanov on board 20) the lone Aussie. The tournament runs for the next 10 days, and there is live commentary for each of the rounds. The tournament website is https://www.gibchess.com and all the details of the main event (plus supporting tournaments) can be found there. There were at least two outstanding games in Round 8 of the 2019 Tata Steel Tournament, both played by the current tournament leaders Magnus Carlsen and Viswanathan Anand. If I had to choose between the two, I'd slightly prefer Carlsen's win over Rapport, although Anand's win over Mamedyarov is also worth playing through. Carlsen outplayed Rapport in 'classical' style. Both players chose what would be considered a 'normal' opening line, but Carlsen quickly made control of the d file the main issue for the game. He was able to use this pressure to get Rapport to create a hole on d5, after which his knight, then rook used the square on the way to attacking Rapport's kingside. The game ended in a nice little combination, reminiscent of how Capablanca would cash in an advantage. While Lasker had defeated Steinitz in 1894 to become World Champion, their was still a rivalry between the two players, right up until Steinitz's last tournament. This was the 1899 London Tournament, won of the strongest events of the 19th Century, although one that is somewhat overlooked today. In the end it proved a triumph for Lasker, winning by a margin of 3.5 points (22.5/30), and featured a brilliant win over the former Champion. Apparently posting something from 10 years ago is currently a thing at the moment, but as with most things, I'm not sure why. So instead of finding an old picture of myself (more hair, no glasses), I instead have dug through the archives for an old game. It isn't quite 10 years old, but it is the closest one I could find. I played it at the ANU Chess Club in 2009, and definitely shows that over the past 10 years my chess hasn't really changed. Basically I got an advantage from the opening, miscalculated a tactic in a good position, simplified into a better ending, and then managed to draw. Richard Rapport has one of the weirdest opening repertoire of any top level player. The fact that his rating stays so high, despite his opening choices, makes many people wonder if he could be a top 10 player, if only he decided to be less "experimental". In round 4 of Tata Steel he played an opening that for a long time I knew as "The Wyers Attack". I'm pretty sure this isn't the real name (if it even has one), but as it was often used by chess player brothers Ben and Marcus Wyers when I was a junior, that is the name I am giving it. The idea was to break most of the rules in the opening, hoping that Black will miss the threat on c7. It is a little annoying to face, as White at least forces to put your pieces on odd squares, but Giri demonstrates what happens once you have protected everything. The traditional season opener, the ACT Lightning Championship is on tomorrow evening (16 January) at the Canberra Chess Club. It is a 9 round swiss with a time limit of G/5m. Entry fee is $10 ($5 juniors) with prizes based upon entries. The Canberra Chess Club meets at the Hellenic Club in the City (Moore St, Canberra City), and registrations open from 6:45pm (for a 7:00pm start). It is open to all ACT Chess Association members ($25 per year, $15 juniors). When I was much younger, there was a bit of a running gag in my chess club about players who tried to draw as many games as possible. "Who did you play?" when one of the top seeds could only draw. "Ivan Swapoff" would come the dispirited reply. Eventually we learned how to deal with such players, by making sure that our remaining pieces were better placed than the opponents remaining pieces. Here is a recent game that demonstrates this policy quite well. Whether Black consciously exchanged as many pieces as possible against his much stronger opponent isn't clear, but what did happen was that White's position got better and better. As a result White was able to play a 'petite combination', winning a pawn, and Black surrendered when it looked like another pawn was going. The 2019 Tata Steel event saw a lot of draws in the first round. One player who started with the full point was Viswanathan Anand, who scored a pretty direct win over Jorden Van Forrest. With both players attacking on opposite wings, Van Forrest lost control of some crucial squares on the kingside, and Anand successfully invaded with rooks and knights. 20.f3 was a small mistake, but 21.Ne5 was the big one. After Anand pushed the f pawn to f4, it was just a question of how Anand was going to finish the game off. I really need to get back to my 1 post a day routine, as I fear I am slipping in keeping this blog relevant. To help me do this, I've decided to look through games from current and recently finished events, looking to find interesting or quirky games. The one I have found for today's post is probably in the quirky category, as black does something I'm not sure I have seen that often. On two separate occasions he pushes a pawn one square (instead of 2) but then completes the two square push on the following move. The first pawn he does this with is the e pawn, and he then repeats the idea with the h pawn. The apparent loss of tempo doesn't seem to hurt, as it is another push of the h pawn that brings the game to a sudden finish. The first big event of 2019 kicks off tomorrow night in Wijk aan Zee. The 2019 Tata Steel event has attracted a very strong field once again, with World Champion Magnus Carlsen returning for the 15th time. He will of course have some tough competition, with Mamedyarov, Liren and Giri the young (ish) challengers, with Kramnik and Anand representing the old guard. But unlike a lot of the other Super GM events, Tata Steel also invites players outside the top 20, so players like Richard Rapport and Sam Shankland will help add excitement to the tournament. There is a a challengers event alongside (with Anton Korobov as the top seed), while the popular side events (9 round and 3 round tournaments) are expected to attract over 1000 players. The tournament website is at https://www.tatasteelchess.com/ Games are scheduled to start at 13:30 pm local time, which is 11:30 pm Canberra Time. For as long as there's been chess, there has been suggestions that chess games can be used to send coded messages. Both correspondence chess, and telegraph chess, have run into problems, when state security officials have misunderstood what they were looking at. However, I have come across an article (from October 2018) where James Stanley has proposed a scheme of using chess moves to encode messages. His method involves turning the letters in numbers, and then uses part of the number to generate legal moves. This is done by generating a list of moves in a position, sorting them in order and matching the number to the move index (eg If Nf3 was the 12th move in the list of moves, this would represent the number 12). There is one flaw this system (as the author himself recognises) and that is the ordering of the moves. He sorts them in canonical order (eg a3 comes before b4 etc), and while this means both sender and receiver both agree on an order, it makes the games themselves rather silly. Any chess literate security agent who saw such a game would realise pretty quickly that this wasn't a proper game of chess. One possible improvement is to use an agreed chess engine (and search depth) to order the moves, but even then, if you need to use the 15th best move, it is going to be a pretty horrible one! Following up my last post on the New Zealand Summer of Chess, here is a nice win by GM Darryl Johansen over IM Kanan Izzat. It is a game that shows Johansen particular talent for having faith in his position, not matter how scary his opponents play might look, before finding the right moment to strike back. Izzat's pawn rush on the kingside certainly looked dangerous, but whether it was one tempo too short, or was simply never going to succeed, did not matter, as Johansen's queenside play proved to be far quicker, and more decisive. Once Johansen played d5, Izzat's position was falling to pieces, and the game ended in a rout. The New Zealand Chess Federation is organising the New Zealand Summer of Chess, and the first events are already underway. The traditional George Trundle Masters has moved from October to January, and sees three sections running side by side. The top section is offering IM norms, while the other 2 events offer promotion to the higher section for the winners. Also underway is the inaugural Oceania Junior Championship, which is for players from the Oceania Zone. A number of countries are represented in the various events, and at last count there were over 120 entries. The first couple of days see Rapid and Blitz while the more serious action starts on the 8th of January. Following these events is the 2019 New Zealand Championship, which runs from the 14th to the 24th of January. It is being held at the Waipuna Conference Centre (sire of the 2017 Asian Seniors) and is open to players from all federations. If you are looking for a lst minute trip to NZ, or just want to follow the action, then details of each event can be found at the New Zealand Chess Federation website. A few days ago the New Horizons space probe did a "fly by" of the furthest object visited by a spacecraft in our solar system. The object was nicknamed "Ultima Thule", which is a greco-latin term for "beyond the known world". I'm not sure how common this expression is (or was), but it seems to have been known to at least one 19th century chess problemist. While flicking through an archived copy of "The Chess Players Chronicle" a came across the problem shown here. It is a fairly basic "White to play and checkmate in 2" problem, although the key move might be a little hard to find. But what jumped out at me was the name of the composer. It was of course, "Ultima Thule"! One of the questions I often see asked is "What is the difference between a 2000 rated player and a 1600 rated player?" There are of course lots of good answers, but one thing that I think separates players of different skill levels is what they know about the position in front of them. At the lower levels, this understanding extends as far as the material balance. Climbing the ladder you will see extra features such as open files or passed pawns added to the list. But it isn't just what these features are, but which ones are more important than others that stronger players understand. Often this shows up when a lower ranked player fails to understand what is happening in the position. Such confusion can then create uncertainty in calculation, before the player self destructs. I often see it in my own games btw, when post game engine analysis reveals I blundered because I panicked in a position where a bit of thought would have shown me an obvious defensive move or plan. Here is an old example, where Black did not understand that White's plan involved putting pieces on c3 and e1, and as a result retreated the bishop to the wrong square (9... Ba5 was best). 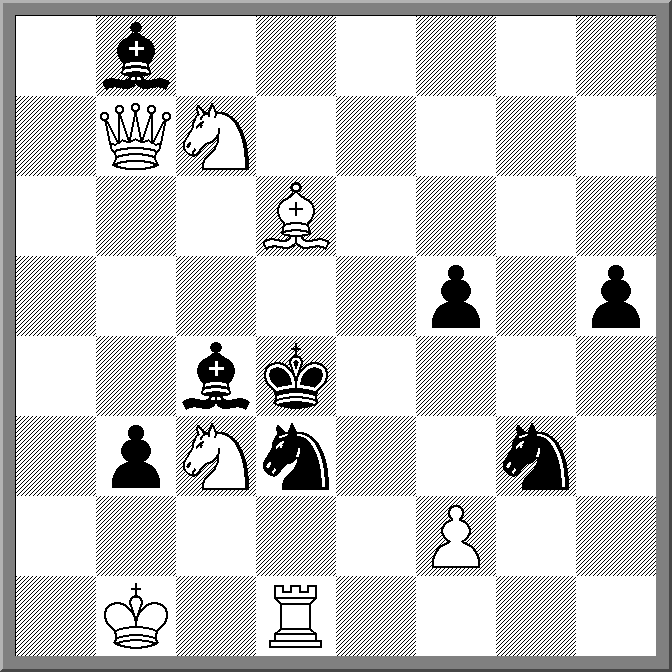 After that Black played a succession of second and third best moves before walking into a mate. In the pre-computer engine age, there were a number of gambit openings that were recommended for club players to try. A combination of surprise value and the initiative, meant that they scored pretty well at the Under 2000 level. Then everyone suddenly had a GM level assistant available to them (on their computer/phone) and suddenly a lot of openings went out of business. Despite this, I'm not convinced that all of these openings should be put out to pasture. 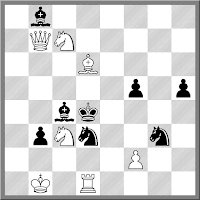 One such opening is the Von Hennig-Schara Gambit , which used to be a favourite of Ian Rogers (at least in his pre-GM days). Black gives up a pawn to bring the White Queen into play, and then gains a few tempo chasing it about the board. A lot of players were introduced to the gambit by "The Guardian Chess Book" by Leonard Barden, which had enough analysis to give Black a reasonable idea of what to do. Even in the age of chess engines, I think the opening is still playable for Black. One model game is from 1931, where Alekhine takes Vasja Pirc apart in pretty short order. Running it through Stockfish, Black always had plenty of compensation for the pawn, and once Alekhine played 13 ... Rxd5 he was easily winning. IM Timur Kuybakarov has won the 2019 Australian Open on countback, after tying with IM Kannan Izzat. Both players won their final round games to finish on 7.5, with Kuybakarov having a slightly better countback. Third place saw a big tie, with 6 players all on 7/9. This included GM's Anton Smirnov and Justin Tan, who took a quick final round draw with each other.